I wanted to make this bag for I don’t know how long now, I got a step closer when I got the fabric from Nicola, but I got distracted with a few other things and unfortunately fabrics just don’t stitch up themselves. With so many new fabrics in stock I knew I had to make it before I even started dreaming on new projects. So I knew I had to act quick, and I am so glad I did finally got off my bottom and did the Grocery bag by Keyka Lou. 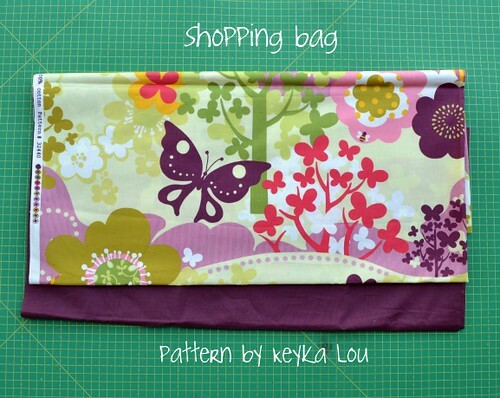 The pattern itself is very easy and quick to make. The bag is small enough to carry with you everywhere, just in case you need it, but big enough to load it up with your shopping. I used Winged Flight in Leaf by Momo for the exterior (on sale!) and Eggplant Kona for the lining and handles. 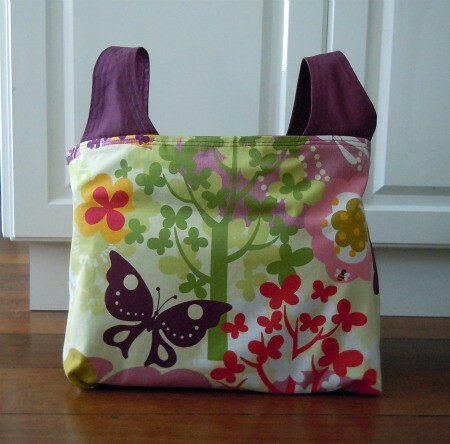 It was very tempting to make this bag with any of the fabrics from the Echo collection, but I wanted to stick to my original idea. I didn’t change much the pattern, I just added a few stitches here and there just because I wanted. 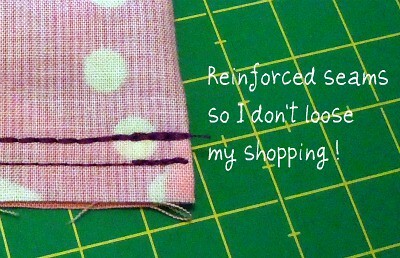 I used triple straight stitch on the bottom seam and to hold the handles just to reinforce the seams. The pattern suggest to double stitch, so I used the triple stitch on the first one and single on the second on. I don’t know if I needed it, but I had never used that stitch so I went for it. I also stitched along the corners on the exterior fabric just to keep them neat. I did it so you can’t see the stitches from above just under the bag. 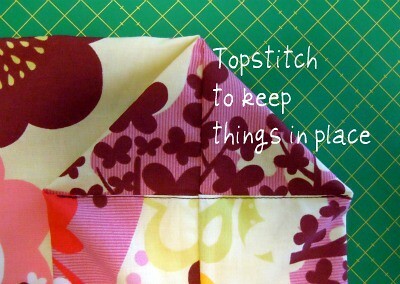 This is a great pattern for beginners and it is very quick to make. It could also be a great present, so if you are making your holiday gifts I highly recommend this one. Now to get organized with the rest of my holiday making! I think it was in a small shop in Portobello Road where I first saw a Lisa Stickley bag and I remember how my pupils dilated and I wanted so much to own every single bag that was on display. Ever since then I have admired her style, and how she mixes simple lines with a contemporary take of vintage details. Her book Made at Home, a guide to simple sewing, published by Quadrille last year, carries on this same style not only on the design of the book, which I love, but also on the projects that she shares with us. I personally admire a designer that sticks to his/her style and in this case Made at Home has Lisa’s stamp all over it. Even at the beginning of each pattern, there is an introduction by the designer that comes across so warm that almost encourages you to make it and makes you wonder why you have not done it before! Although the projects might be a bit basic for the experienced sewer, they are so varied that you will definitely find something that you want to do, or always been wondering how to do, I even bet you will find in this book better instructions of how to do something that you have done before. Another great thing about the clean design of each pattern is that whether you like to use natural linen, animal print or kawaii fabrics you are not going to be put off by the style of the projects. All the opposite actually, you can see your favourite fabric working in either of the 30 projects in the book. And as you get more comfortable with the pattern, you can start adding things to it, ruffles if that what you like, or maybe a border on different fabric; after all, like the title says it, this book it is a guide to simple sewing, you can make it as complicated as you want! or even a bit fun and inviting to get you out of your comfort zone like the roman blind or the pouffe (which by the way she suggests to use all those scraps of fabrics to stuff the pouffe for a firm and weighty feel. I told you she was a clever girl!). I guess that the best way to describe this book is a blank canvas with very clear instructions on how to sew things at home. At least to me, it does encourages me to go ahead and make something and put my own stamp, which is why I love so much about making my own things, don’t you think so? Hi! This is the journal about my shop. It's where I write about the fabrics that I sell, creative handmade stuff that I come across and any other thing that intersects my life.